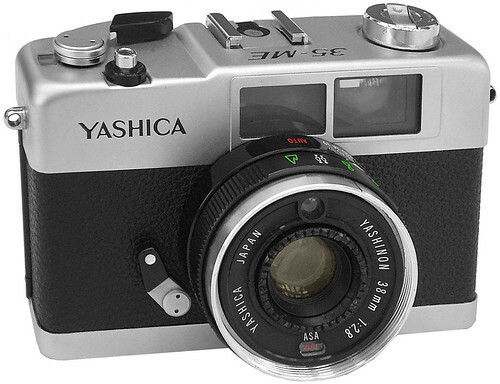 The Yashica 35-ME is a small, compact 35mm viewfinder camera with auto exposure, made in Japan by Yashica, introduced c. March 1972. It uses a 38mm f/2.8 lens made of 4 elements in 3 groups with a screw-in filter size of 46mm. The film speed is set using a ring around the lens, with the setting window on the bottom face of the lens. The metering system uses a CdS sensor with a sensitivity of 8 to 17 EV. The viewfinder has bright line frames with parallax correction marks for focus distance of 1.5 meters or closer. The shutter display scale is on the right of the finder has speed markings 1/30, 1/60, 1/125, 1/250 and 1/650 of second. Aperture scale is also displayed at 2.8, 4, 5.6, 8 and 14. The setting for the meter uses a pointer type indicator. Correct exposure is assured when the pointer is in the yellow areas of the scales. Also in the finder scale is over exposure, under exposure zones along with symbols of the selected zone focusing settings. The top plate carries the shutter release, hot shoe and frame counter. Flash: hot shoe, flash sync 1/25 of a sec. This page was last edited on 5 April 2019, at 05:47.